Learn how to add a bank account, set a default bank account and issue a credit note. Log into your account (See Logging In - How to Log Into Your Account for more details). Open the Financials tab and click the Bank Account link in the navigation menu. You will be presented with a table of your current Business Bank Account. The payments listed in the table reflect the bank transactions that have been entered into the portal. Click the Add Bank Account button. 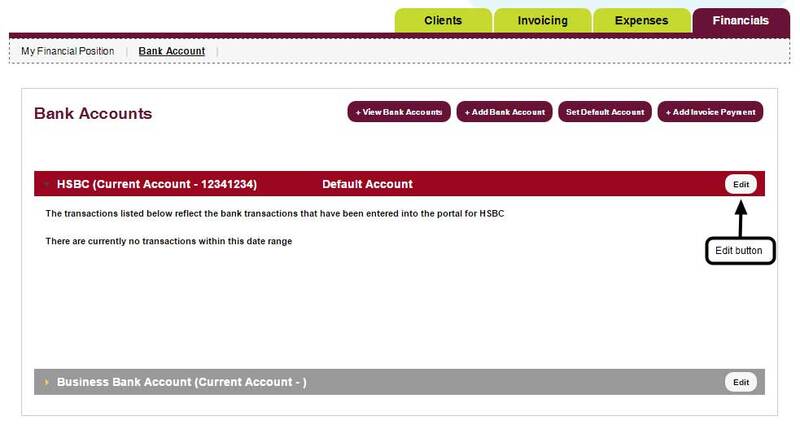 View Bank Accounts – displays a list of transactions from your current business bank account. Set Default Account – allows you to set a default business bank account. This is particularly useful if you have set up multiple accounts. (See Financials & Dividends - How to Set a Default Bank for more details). Add Invoice Payment – allows you to add a payment to an outstanding invoice. (See Invoicing - How to Add an Invoice Payment for more help). Edit – allows you to edit the details of your business bank account. You will be presented with a form. Bank Name - enter the name of your bank. Account Type - use the dropdown box to select an account type. Sort Code - enter your 6 digit sort code (please enter two digits per box). Account Number - enter your 8 digit bank account number. IBAN (International Bank Account Number) - enter your IBAN number (if applicable). BIC (Bank Identifier Code) - enter your BIC number (if applicable). NOTE: Aside from Bank Name, all fields are Optional. Please leave them blank if you do not wish them to appear on your invoice. Complete the form and click the Add Bank Account button to save your details. NOTE: Please see Financials & Dividends - How to Set a Default Bank Account if you wish to learn how to set your new bank account as a default. Click the Set Default Account button. Use the dropdown box to select an account and click the Set as Default button to save. 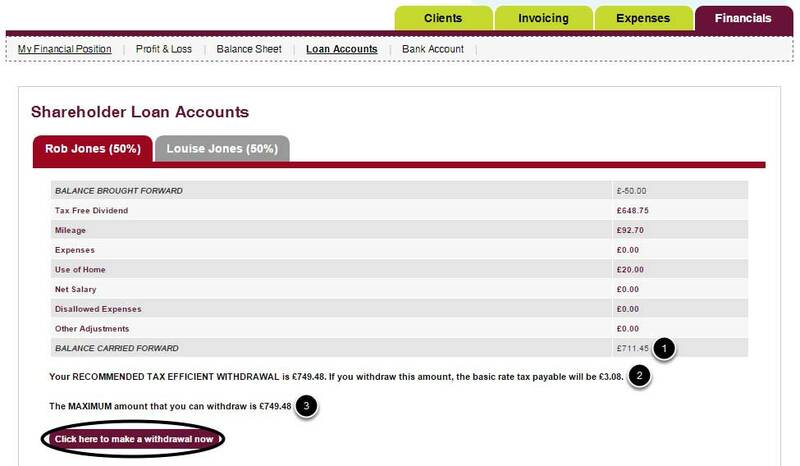 Your new default account will display at the top of the Bank Account dashboard in an expandable/collapsible bar. Click the Edit button in the bar if you would like to edit the details. Open the Financials tab and click the Issue Dividends button. You will find that there is a table at the top of the page titled Shareholder Loan Account that will detail any mileage, expenses or salary that is currently owed to you by the company and will also give you an amount, if any, that you can withdraw as a tax free dividend. These amounts will total up to what is labelled as the Balance Carried Forward. Click the Click here to make a withdrawal now button once you have decided on a figure that you wish to withdraw. Balance Carried Forward – this amount is what you can pay yourself from the company without incurring any personal tax. 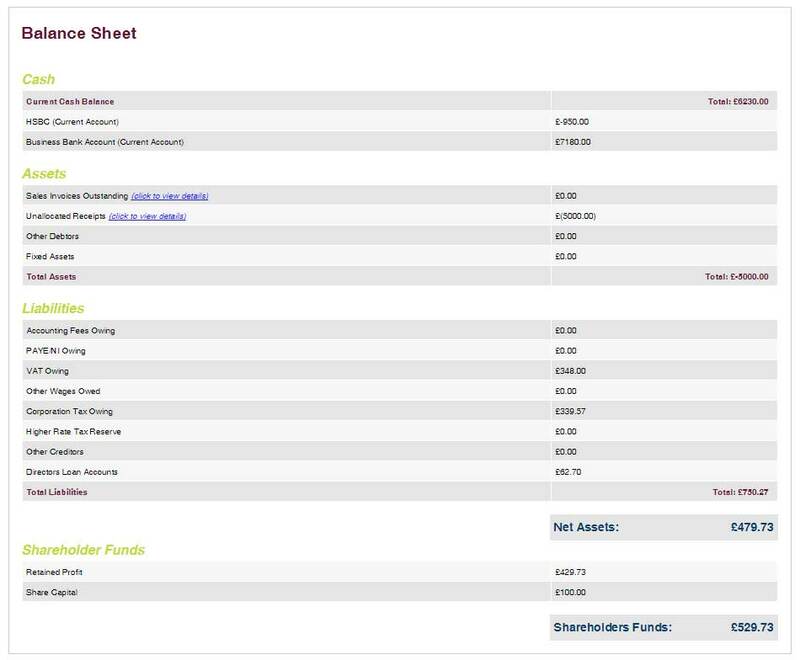 Please see Financials & Dividends – The Financials Dashboard Explained for a more detailed understanding of this table. Enter the amount you wish to withdraw in the first field. You will notice that when you enter an amount, the two fields underneath will automatically calculate any tax due on your withdrawal if you have withdrawn more than the tax efficient amount. If you are happy with the amount, click on the button at the bottom of the page. A preview will appear on screen. Click the Confirm and withdraw button if you want to proceed with the given amount. This is very much an overview page. You will find over the course of time that a number of tasks appear on the left hand side of this page, these will include accountancy fees due, VAT, PAYE and corporation tax payments due. For any payments that need to be made to HMRC you will have separate correspondence from us but these tasks should serve as a reminder each time you log on to the portal and can also be ticked off once paid. 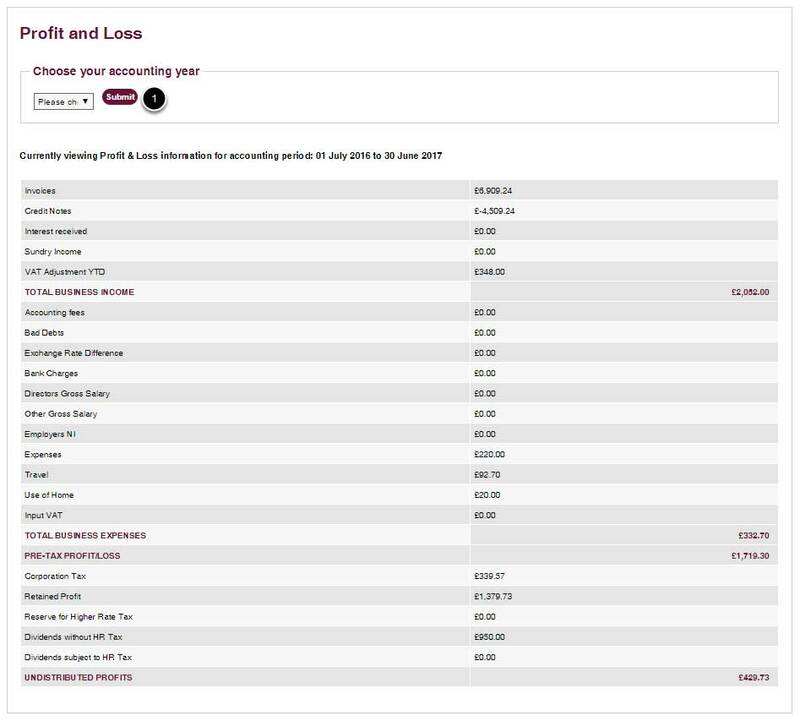 The right hand side of this page gives a quick overview of your company’s current position for the accounting period we are in; to understand where these figures are coming from you can click on ‘view full report’ or ‘profit and loss’ at the top of the page you will go through to the same area. This page is where you will go when you are looking to pay yourself anything from the company be that salary, dividend or to reimburse for any mileage and expenses. You will find that there is a table at the top of the page that will detail any mileage, expenses or salary that is currently owed to you by the company and will also give you an amount, if any, that you can withdraw as a tax free dividend. These amounts will total up to what is labelled as the ‘balance carried forward’; this amount is what you can pay yourself from the company without incurring any personal tax. You will also find that there is a figure underneath this table that is detailed as the ‘recommended tax efficient withdrawal’; this figure is the amount that you can withdraw from the company whilst staying below the threshold for higher rate tax. Any dividends within this figure (and over the ‘balance carried forward’) will be taxed at 7.5%. 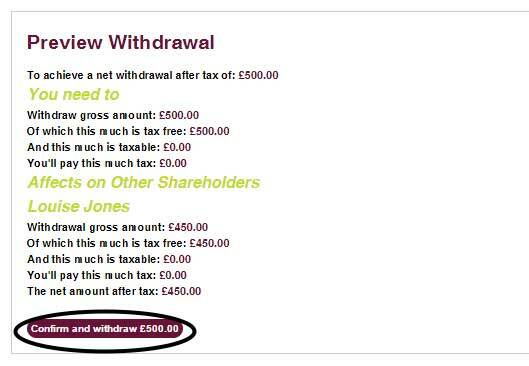 Please note that the final figure given is labelled as the ‘Maximum amount that you can withdraw’ and this is very maximum that you can take from the company whilst retaining sufficient funds to pay any liabilities due. You are able to withdraw all of these funds if you wish but please do bear in mind that anything withdrawn over and above the tax efficient amount will incur personal tax at a rate of 32.5%. You may also find that, at the moment, you are limited by cash in your current account but again once the company has built up cash and has been trading a bit longer this should not be an issue. Please note that you are able to withdraw any amount within these guidelines, if you do not take the full amount showing you will not lose it and it can be taken later on. You may also take funds from the company as and when you wish although we do recommend that you do not do this any more frequently than monthly. It is important that you record all of the withdrawals you make from the company account in order to keep the portal as up to date as possible, if withdrawals are not recorded the information displayed regarding available profits and tax liabilities due to HMRC will not be accurate. The profit and loss area gives you a detailed breakdown of the company’s activities. The information given relates to the current accounting period and will run up to 31 May 20XX after which you will find that these figures all zero out and the calculations begin again for the next accounting period. Please note that you will still be able to see historical information by choosing the year in the drop down box at the top of the page. The figures appearing within this page reflect the entries made on the portal, i.e. the invoices figure is the total of all invoices raised so far. The balance sheet is where you will find your real time advice regarding the company’s assets and liabilities. Providing that the portal is kept up to date with invoices, expenses and any amounts withdrawn from the company by yourself, this page should give you a very good guide as to what amounts will be due to HMRC in respect of VAT, PAYE, Corporation tax and, if applicable, any personal tax due on dividends you issue. This page will also tell you the current retained profits that are available for a pre-tax dividend. The Directors Loan account figure relates to the loan account page as detailed below, please note that this is purely accounting terminology and we have not recorded a loan between yourself and the company.